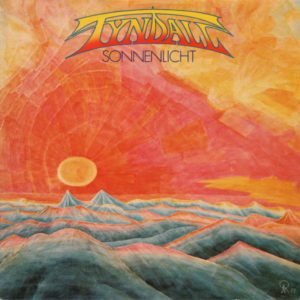 Bureau B present a reissue of Tyndall’s debut album, Sonnenlicht, originally released in 1980 on Sky Records. The two electronic sonic inventors Jürgen Krehan and Rudolf Langer founded Tyndall in the year 1980, naming their duo after a light scattering phenomenon in physics. Armed with an impressive array of instruments, devices, and home-made synthesizers, they created free and easy electronic music in the style of the Berlin School (Berliner Schule), much to the liking of the legendary Sky Records who released their debut album. The Tyndall effect becomes visible, when light beams are deflected by microscopic particles in suspension. This explains the patterns of light we see when the sun shines through mist or fog for example. The very name of Tyndall evokes a bigger picture — in the same way as celestial light was a common feature of canvasses in Romanticism and the Renaissance: a dramatic symbol for the overwhelming beauty of nature. Musically speaking, the album fits seamlessly into the Sky Records canon of the period. It nicely illustrates how synth pop sounded in those days: luxuriant indulgence in synthetic sounds, arpeggios, bass sequences, carefree melodies, accompanied and powered by synth escapades and a computer beat. Tyndall owned the very first CR-78 drum computer in Germany, provided by the manufacturer Roland before the official street date when they heard it was to be used on an LP recording. Today the CR-78 is regarded as a drum computer classic. The duo also deployed a formidable range of analog instruments: several semi-modular Roland System synthesizers, a Hohner String Melody String Machine, and electric pianos. This list also formed the basis of their live arsenal for the many concerts they played. Sonnenlicht reflects their cheerful, nonchalant journey into new territory. Sonic explorations and sweet melodies spread out over octave basses, delays, and arpeggio patterns. The musicians were not afraid to add layers of noise or effects — albeit not quite to the same extent as they would on their next album, 1981’s Traumland (BB 287/LP).